Greetings from Beautiful Christchurch on a crisp, clear Autumn morning. Following our North Island competition on 21 March, we wish you could have been with us last evening at the Finals. We had a wonderful evening with the Rotary Club of Lincoln. A delicious dinner followed by the speech contest. Unfortunately the computer/projector could not be made to work so the speakers all had to just speak without the enhancement for their photos for their story. This was especially difficult for Michael whose photos were an integral part of his speech. But he and our two beautiful young ladies acquitted themselves very well and Rob and I and their parents/support workers were very proud of them. 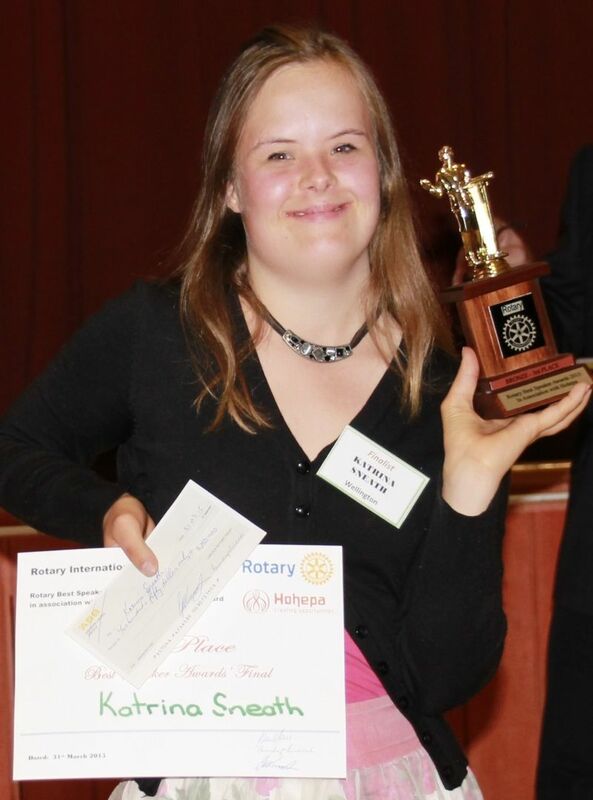 Katrina Sneath, with her angelic smile, is proudly bringing the third place trophy home to Wellington. Michael and Laura were so gracious in defeat that it was lovely to see. Michael made sure he got the contact details of Belinda, a beautiful fellow contestant from Christchurch. All three of our team tell me they want to be part of the adventure next year. Editor's note: We have been told that Laura and Katrina were treated in the plane home like celebrities. One nice flight attendant announced them and their achievement over the speakers and the whole plane was clapping for them. Then even the pilot invited them into the cockpit. What a treat they received! Original generation time 1.4080 seconds.